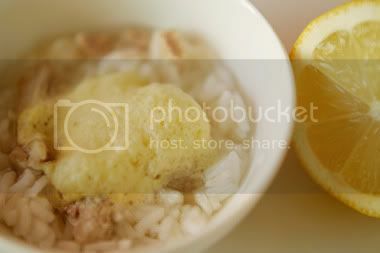 I found this great recipe for Greek avgolemono soup via The Smithsonian's food blog, Food & Write. 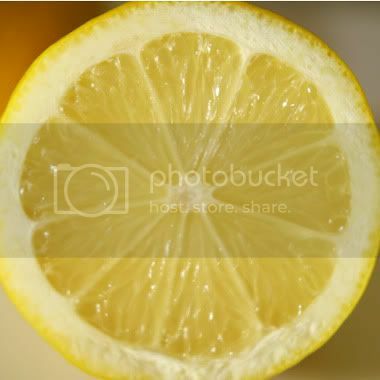 Avgolemono refers to sauces and soups made with lemon, egg, and broth, and popular in the Mediterranean. Even though there were a bunch of steps (you have to make broth—so time-consuming! ), there are easy ways to cheat. Which means I probably cheated myself out of some richness, but I was both hungry and curious, and hungry won out. I simply simmered a chicken thigh (not a whole chicken) as suggested by the recipe, instead of putting it in the crockpot for hours. Day old rice is also good to have, which cuts out about half an hour of cooking right there! But the real intrigue lay in the egg foam. The recipe calls for the eggs to be separated, beaten, then brought back together with some lemon juice. Which means the eggs remain raw. Though I'm guessing the lemon juice "cooks" the eggs much like it would in ceviche. Rest assured there were no ill effects from consuming said egg foam. Plus, it was really pretty floating on top of the plate. Foamy! The recipe I borrowed comes with a sweet story by writer Christie Zgourides. She first made this for her boyfriend's birthday (he later became her husband) and the rest is history. My soup was lacking something, and it wasn't merely all the cheating I did. I'm used to a bit more bite in my food, and I was tempted to put spices in this. Maybe it just needed more salt...I'm not sure. I'm going to revisit it one day. Maybe add the harissa I finally procured. Mmm. 4. While broth is heating, beat egg whites stiff in a small bowl. 5. 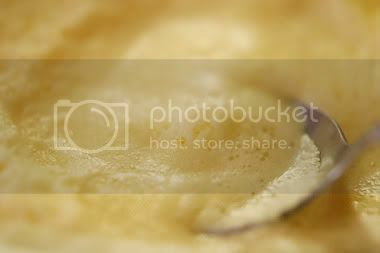 In a separate, larger bowl, beat the egg yolks till foamy. 7. Combine stiff egg whites with yolks. Mix together slowly, using the low setting on mixer. 9. Add mixture to broth and rice mixture, and barely stir into soup. There should be foam on top of the soup. 10. Remove from heat and serve with crackers, de-boned chicken, and Greek salad. I liked the foam just resting on top of the soup. Add the shredded chicken to the soup, and enjoy.